The operatically baffled guy in the center is Kevin Glavin. 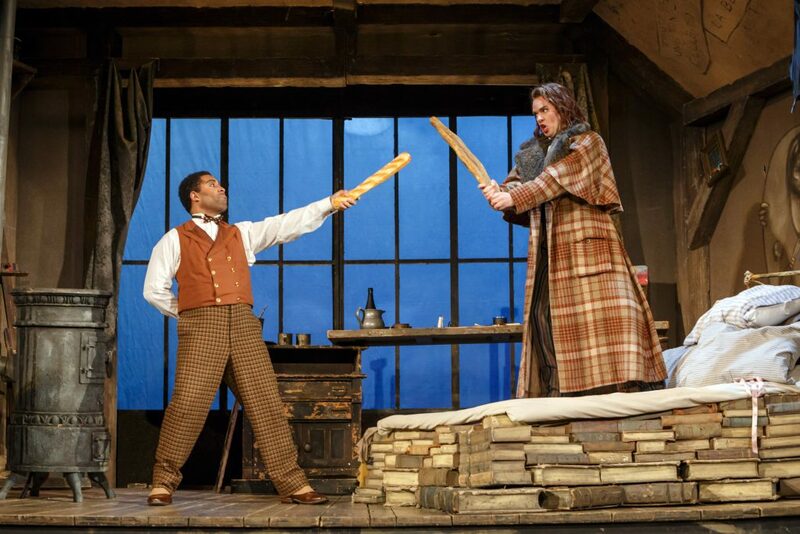 He is the bohemians’ landlord in ‘La Boheme’ at Pittsburgh Opera, and he’s learning that the boys do not plan to pay the rent. Pittsburgh Opera is staging one of the most popular operas of all time, La bohème. The opera was created by the Italian composer Giacomo Puccini, with librettists Luigi Illica and Giuseppe Giacosa. La bohème revolves around the highs and lows of the lives of four poor creative types—bohemians. I attended the opening night performance and came early for the pre-opera talk by the company’s Kristin Gatch. She gave substantial background information about La bohème that aided in a deeper understanding of the opera’s context and thematic elements. Gatch said the inspiration for the opera came to Puccini through an 1851 book of short stories, Scènes de la vie de bohème, by the French novelist Henri Murger, who was one of the first to write about the bohemian movement in Paris’s Latin Quarter (The Left Bank). The stories were loosely based on a time when Murger and his friends were so poor they couldn’t afford wine in the cafes and humorously called themselves “the water drinkers.” Puccini also drew upon his own experiences as a student in Milan to create his 1896 masterpiece. After the French Revolution ended in 1799, Gatch explained, society was more egalitarian so there were fewer patrons for the arts, and thus less money for creative individuals like the bohemians to live on. The bohemians were also nonconformists who enjoyed freedom from traditional work and life. They enjoyed doing their creative works and having fun in life, even if it meant economic hardships. Gatch also spoke to how Puccini created individual theme music for the people, places, and things in La bohème. 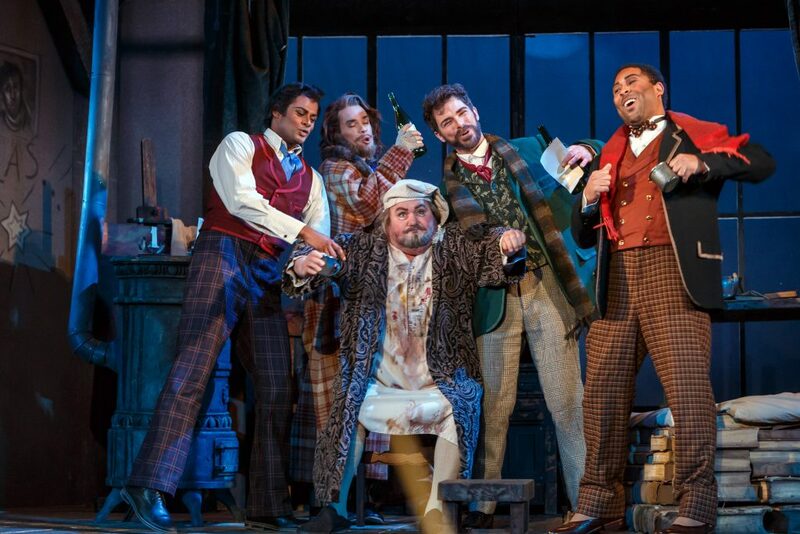 La bohème is a slice-of-life story about four bohemian friends and their lives: Rodolfo (tenor Sean Panikkar), a poet and playwright; Marcello (baritone Craig Verm), a painter; Colline (bass-baritone Tyler Zimmerman), a philosopher; and Schaunard (baritone Benjamin Taylor), a musician. The opera opens on a stage set of a shabby Paris apartment. In Rodolfo’s humble one-romer there’s a potbelly stove, a table, and a bed with not a mattress but stacked books with a sheet and pillow on top. It’s very cold in the apartment and there’s nothing left to burn in the stove. Rodolfo tells Marcello that he can’t take the cold and says, “I don’t believe in the sweat of the brow” any more. And that he will burn his latest manuscript. As they burn it page by page they both joke about how brilliant it is. The landlord Benoit (basso buffo Kevin Glavin) knocks on the door; he is there to collect the rent that was promised to him previously. (La bohème inspired the hit Broadway musical Rent). One of the cool things about opera is that everything is sung, so something as mundane as “There’s someone at the door” sounds beautiful. La bohème is sung in Italian, but the story is easy to follow thanks to an easy-to-see captioning display above the stage in English. All four friends are together in Rodolfo’s apartment and they let Benoit in. They then ply him with wine and prod him to tell bawdy tales of his sexual exploits. They feign surprise and mock shame and send him on his way, without the rent payment of course. 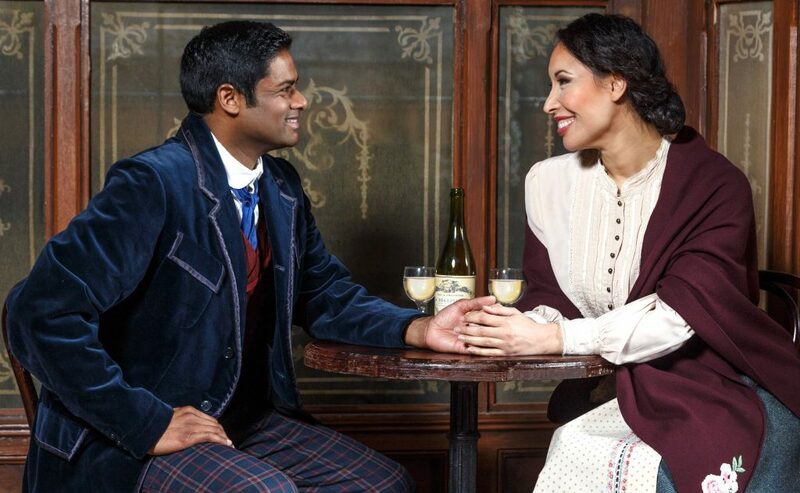 Rodolfo (Sean Panikkar) and Mimi (Nicole Cabell) are all decked out for a happy first date. The friends except for Rodolfo depart for the cafe. He tells them he will be along shortly, that he wants to do a little more writing first. He hears a knock on the door, an it is his lovely upstairs neighbor Mimi (soprano Nicole Cabell). Her candle has blown out in the drafty hallway and she wants to relight it with his candle. Rodolfo becomes infatuated with Mimi and tries every trick in the book to get her to stay a while longer. Panikkar and Cabell show their acting skills in the scene: he the captivated pursuer and she the demure, shy seamstress with downward glances. She stays, they talk, and a love affair blossoms. The themes of Act I carry through the rest of La bohème. We follow four poor friends having fun and trying to make their way through life, with Rodolfo and Mimi’s romance coming to the fore. Schaunard (Benjamin Taylor) has brought baguettes to his friends. He and Colline (Tyler Zimmerman) have a pretend sword fight with them. The sets for the Pittsburgh Opera production are quite magnificent. In Act II there’s a Paris street scene replete with tall buildings and even some snow falling, as Parpignol (tenor Terrence Chin-Loy) pushes his cart of toys through the street, captivating a group of children. In the Cafe Momus scene of Act II we are also introduced to a whirling dervish of a character, Musetta (soprano Sari Gruber) and her sugar daddy, Alcindoro (also played by Glavin). During the scene, a past love affair rekindles between Musetta and Marcello to humorous effect. The Cafe Momus set is quite striking, too, with decorative lighting, wooden booths, and tables. The entire cast of La bohème does a fantastic job of acting and singing their arias. There are many light touches of comedy throughout. One especially funny scene comes when Colline (Zimmerman) sings about having to sell his nice coat. The talented orchestra in the pit, led by Conductor Jean-Luc Tingaud, beautifully played Puccini’s score. La bohème is a highly enjoyable night at the opera. Scenic design by Michael Yeargan and costume design by Zack Brown help to set the 1800s Paris mood. Lighting is by Andrew David Ostrowski and James Geier is wig and makeup designer. The production is stage managed by Cindy Knight and Mark Trawka is the chorus master. Pittsburgh Opera is staging La bohème through April 7 at Benedum Center. For tickets and information visit the Pittsburgh Opera website or call the box office at (412) 456-6666. 237 7th St., Cultural District. Photos courtesy of Pittsburgh Opera and David Bachman Photography. Rick Handler is the executive producer of Entertainment Central Pittsburgh.